Is This Our First Look At The 2018 Ford Bullitt Mustang? Looks like the 2018 Bullitt Mustang has been spotted at a Ford commercial film shoot in Chicago. 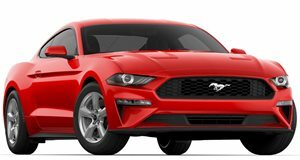 The recently refreshed 2018 Ford Mustang is currently on its way to showrooms, but a new special edition variant could be just around the corner. Rumors have been rife this year that Ford is developing another Bullitt-edition Mustang based on the current model after some sketches were spotted in a promotional video starring Dwayne Johnson. And now it’s possibly been spotted out in the wild for the first time without any camouflage concealing its green bodywork. A user on Mustang6G.com snapped a photo of a Ford that looks very similar to the Bullitt Mustang sketches during an apparent commercial shoot in Chicago. Unfortunately, the only photo they captured isn’t great quality and is dimly lit, but you can still make out the distinctive dark Highland Green finish and five-spoke wheels with black spokes and chrome accents you would expect to see on a Bullitt-themed Mustang. It will also feature Bullitt-style rear window louvers and a rear faux gas cap, but it’s difficult to tell if these details are present in the photo. A leaked window sticker also revealed that the 2018 Ford Bullitt Mustang will be sold exclusively with the 5.0-liter Coyote V8. It will also available with either a 10-speed automatic transmission or a six-speed manual. Ford has yet to officially confirm its existence, but if the automaker is filming a commercial for the new Bullitt Mustang, a reveal at next year’s Detroit Auto Show in January seems likely. It would also neatly coincide with the 50th anniversary of Bullitt's theatrical release that gave us one of the greatest car chases of all time. This isn’t the first time Ford has paid homage to the 1968 Ford Mustang 390 GT Steve McQueen drove in the film. In 2001 Ford released a Bullitt-edition Mustang based on the fourth-gen model, followed by another in 2008 based on the last-generation model. Hopefully we'll find out more at Detroit in January.